Today, I have a collection of shadow and light photos shot recently. All of them were taken on sunny days - some indoors, some outside. I hope you enjoy them. 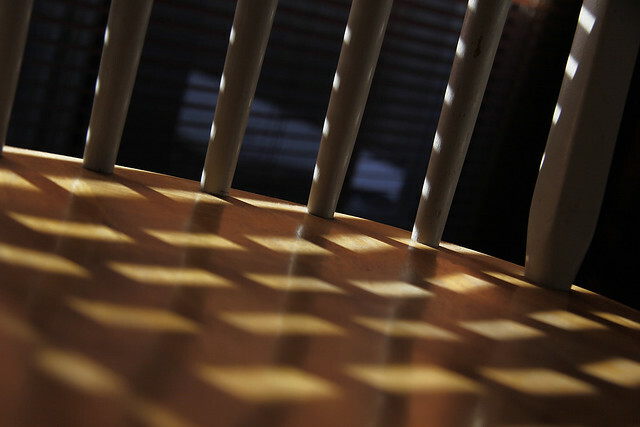 Shadows from the vertical bars combined with the horizontal lines of a Venetian blind created a woven appearance across the seat of this chair. 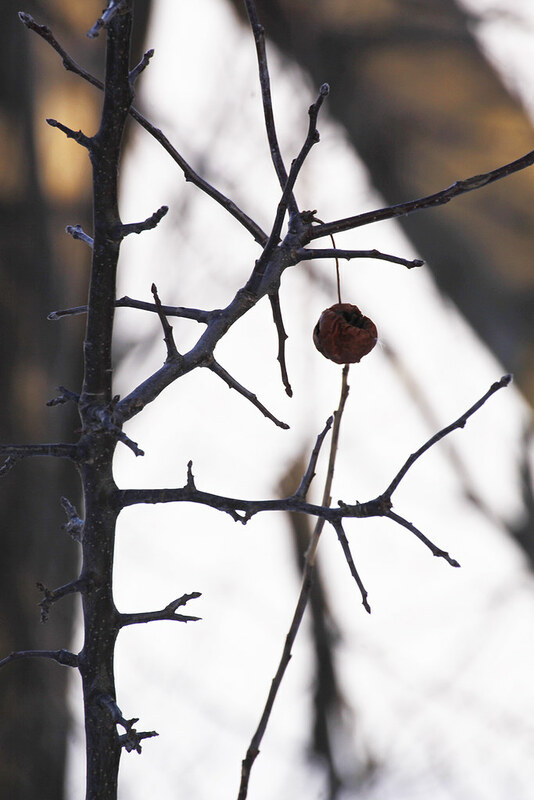 Deep within the shadows, one single fruit remains on this twig while the sunlight dapples the branches behind it. 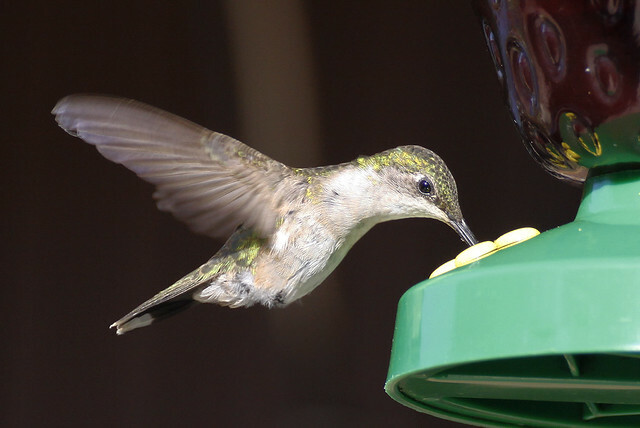 If you look closely, you can see that a tiny feather or seed clings to the right side of the fruit. I couldn't tell which, as this was taken from a significant distance with awkward terrain between me and the subject. Plus, I only noticed it upon uploading the image. 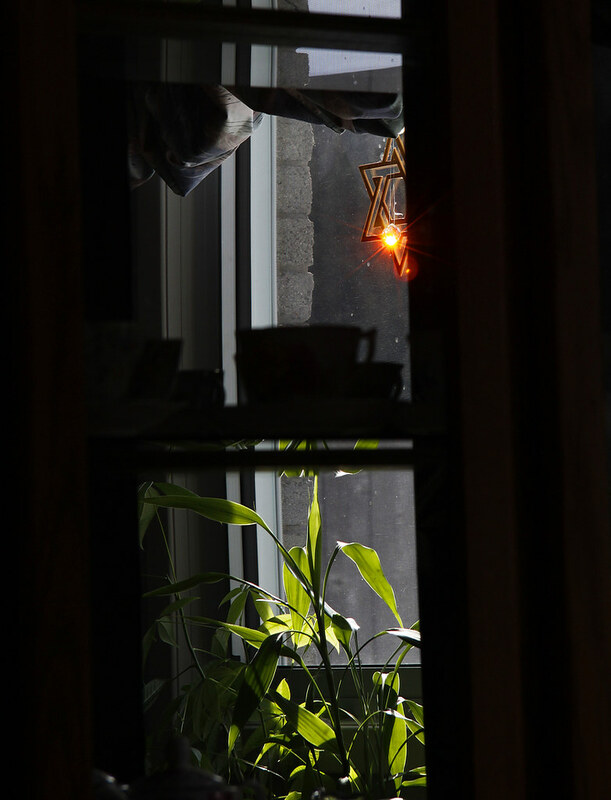 At my cousin's house last week, I happened to notice a Star of David window ornament as it caught the light and reflected in the glass of her buffet. It took about a dozen shots before I finally captured the red sparkle that my eye was seeing but the camera was not. 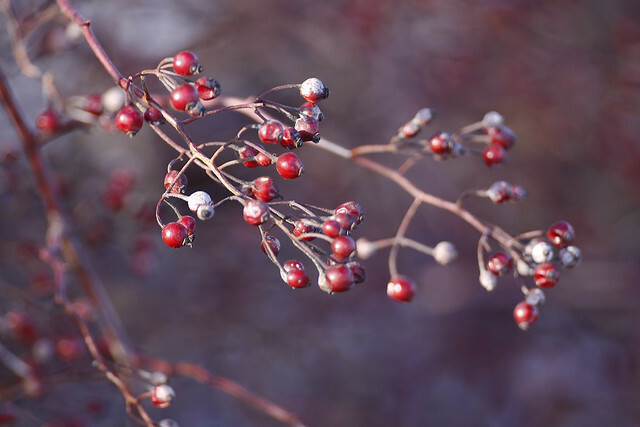 Most of this bush was in shadow but the sun warmed this single branch of berries. This plant is what keeps the Mockingbird (seen in the previous post) coming back. 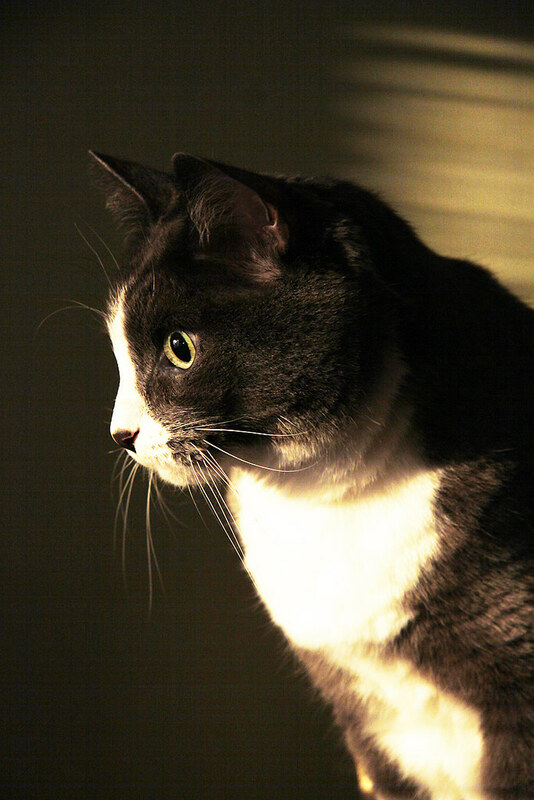 This is my beautiful Zephyr with sunlight streaming in on his soft, silky coat. He's incredibly affectionate and we love him dearly. He is also an enormous klutz, unintentionally knocking things down at least twice a day. How embarrassing for a cat which is ordinarily such an agile creature, you'd think but he's quite oblivious to his furry deeds. Zephyr is not the brightest cat I've ever had, nor is he close to as curious and sociable as his brother, Skittles but he will almost always "purr on demand" - at least for my son and me. He also responds to his name with a quick meow. 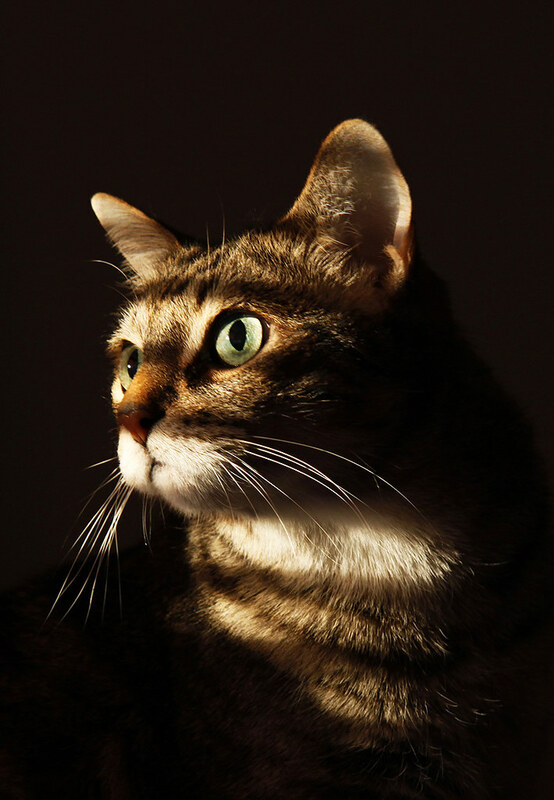 I've had long conversations with him as we each utter a sound to one another in response to the previous word or meow. 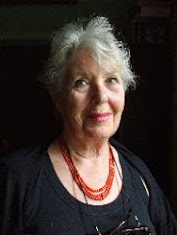 One day, I'll try to record one of our chats (which also happens to be French for cats) and post it for you. The section of the pond which melted last week remains open despite the drop in temperatures which followed shortly afterward. 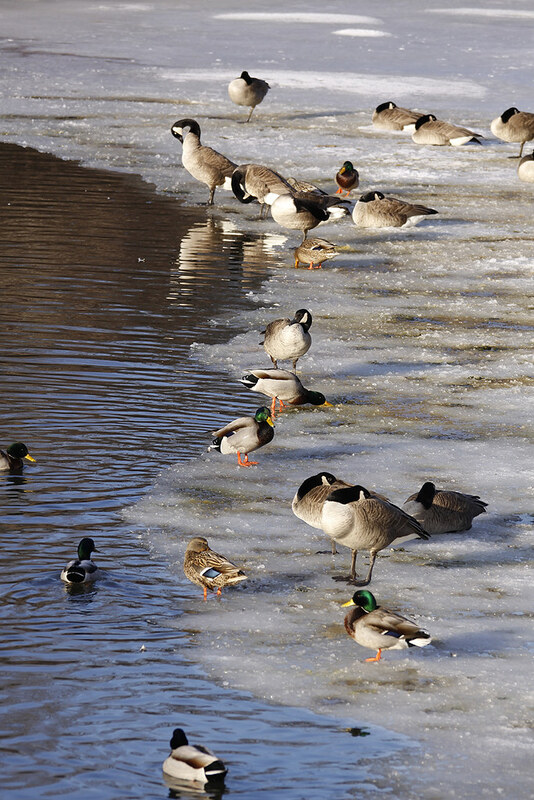 On this late afternoon, the sunlight illuminated that point where ice meets water, and where ducks and geese warmed their feathers while some napped and others rummaged for food. 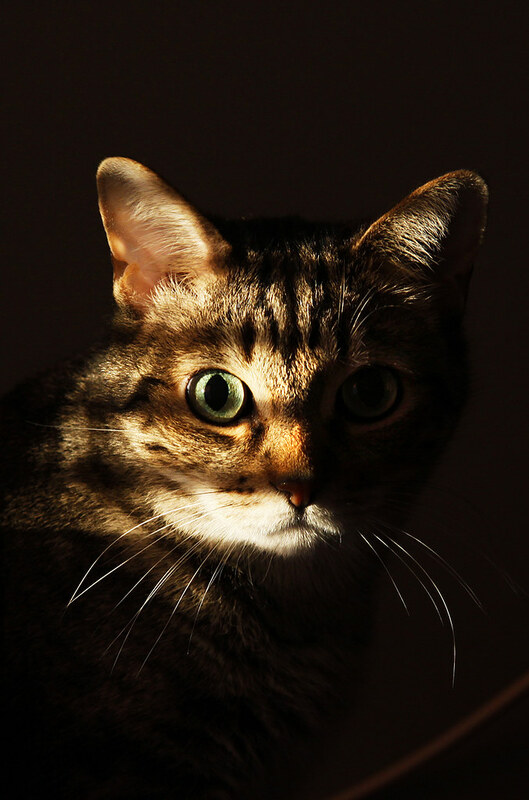 Thanks for joining me in the shadows and light. Last week, we had a couple of very mild days. 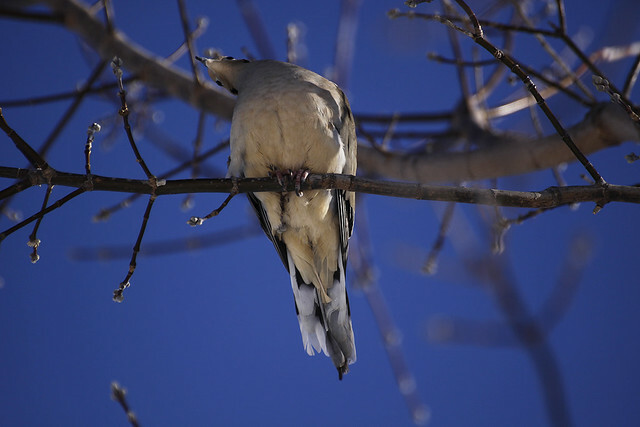 The snow and ice of the previous weeks were melting quickly and despite the high winds, it was a very lovely day. I would have loved it if you could have accompanied me on this walk. Join me now, won't you? The thawing pond creates a backdrop of puddled whirls and swirls for this partial tree limb. 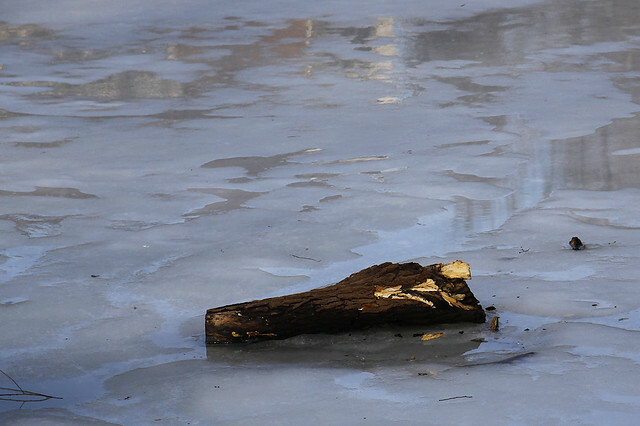 The piece was lodged in the ice throughout the cold months. I wonder who was gnawing at the bark recently to expose the fresh wood. 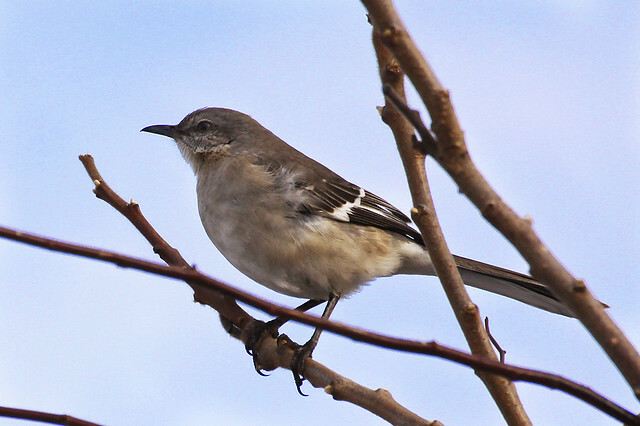 Looking up, I see one of my favourite birds - the Northern mockingbird. 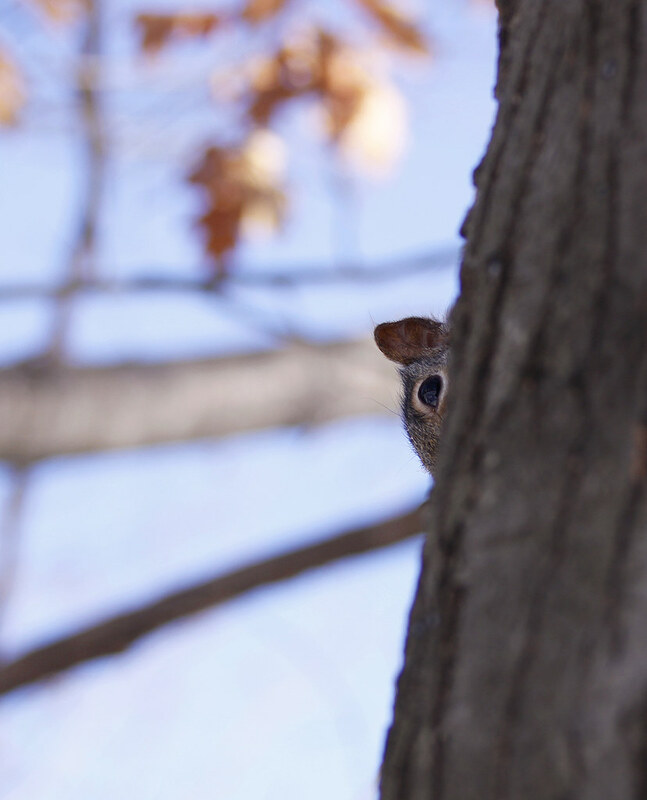 They generally seem quite bold and curious, and they rarely shy away from the camera. In spite of that, this guy only stuck around long enough for me to get one shot. 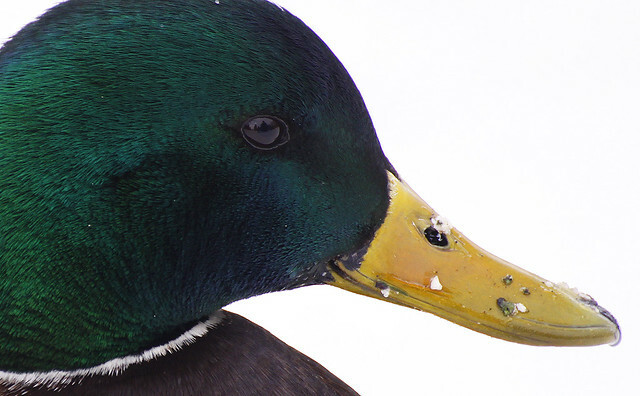 Thank you, my feathered friend. 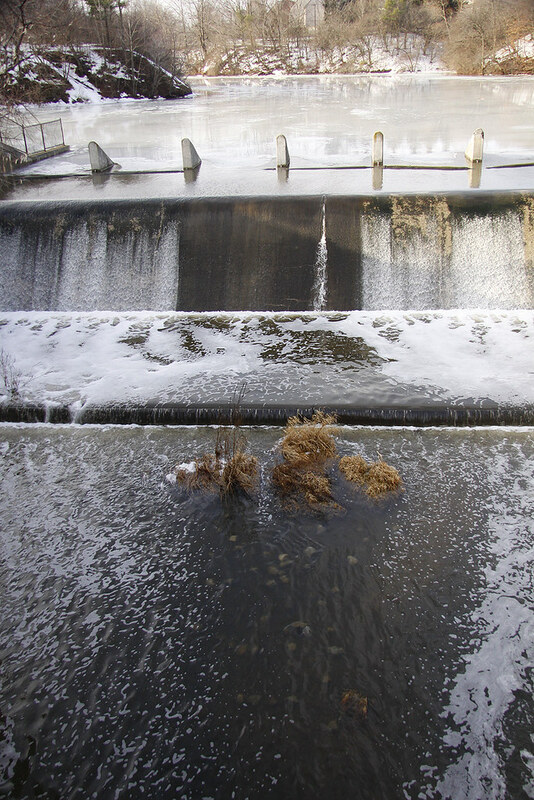 The dam at the end of the pond could be heard long before it was visible. The waters were raging as the ice melted. It's difficult to tell that in a still image, I know but that water was moving rapidly. A sure sign of a long-anticipated, approaching spring. Walking along, I heard a half-friendly, half-warning WOOF. 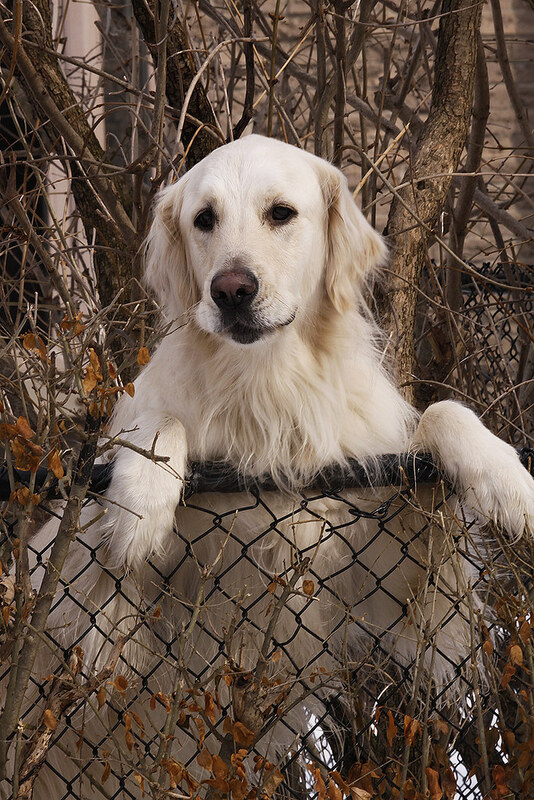 This sweetie kept on barking at me from behind the fence, until I spoke to him. Then, up he jumped to get a good look at me. We chatted with one another for a bit, and then I continued on my way. As soon as I turned my back, he resumed barking, just to prove to his people that he really was being a good watchdog. The day began to cloud over, and all you could see of the blue sky was showing through this small hole in the clouds. 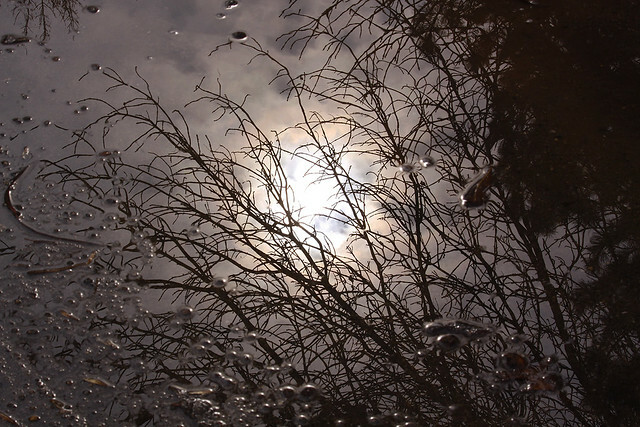 The sky, clouds and bare tree limbs reflected nicely in this bubbly puddle which had been biding its time as a patch of ice the previous day. As always, the squirrels awaited their treats. This guy came and took a peanut right out of my hand. He showed his appreciation by kindly obliging me with a handsome pose before making his way up to a branch to enjoy his snack. We've since had more snow and some very cold weather come though but I'm grateful for the springlike day, and for the ice-melting and heart-melting scenes I encountered. Thanks for joining me. 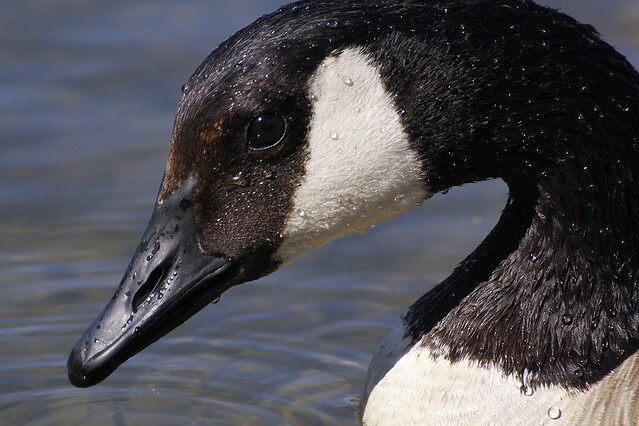 With all of the attention that the ducks got in the last post, I felt that I should have focused on the geese a bit. 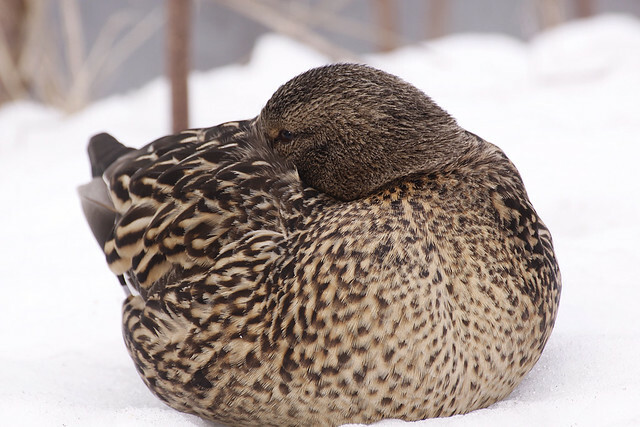 After all, they inhabit the same pond as their Millie and the gang. The photo of this beauty was actually taken sometime last year but I thought I'd share it anyway. This week's POTW goes to.. Gather around everyone. 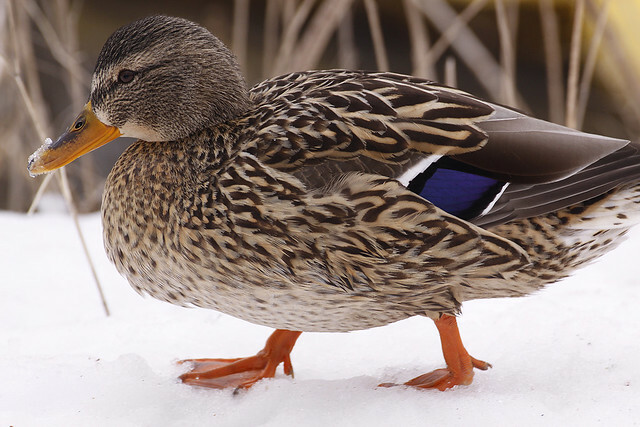 It's time for a rousing game of Milly Mallard Says. The flock waddled in to share in the fun. 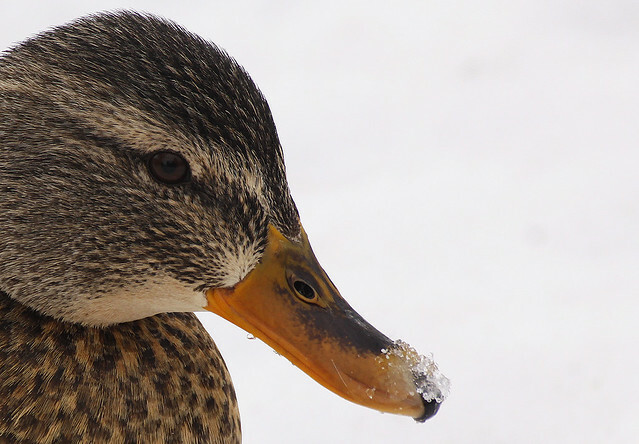 Delia Duck took the short cut. 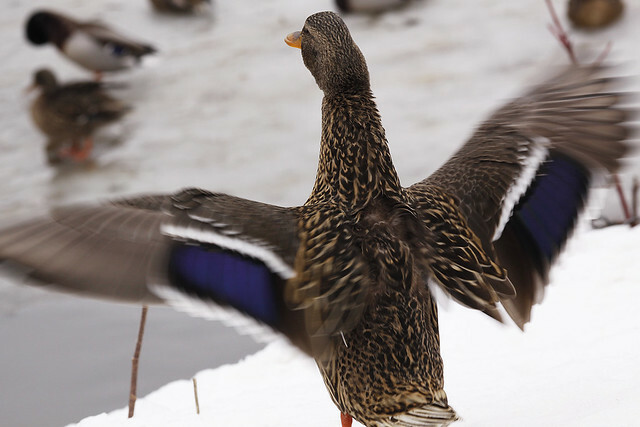 Milly Mallard says "Flap your wings in the air." Excellent. 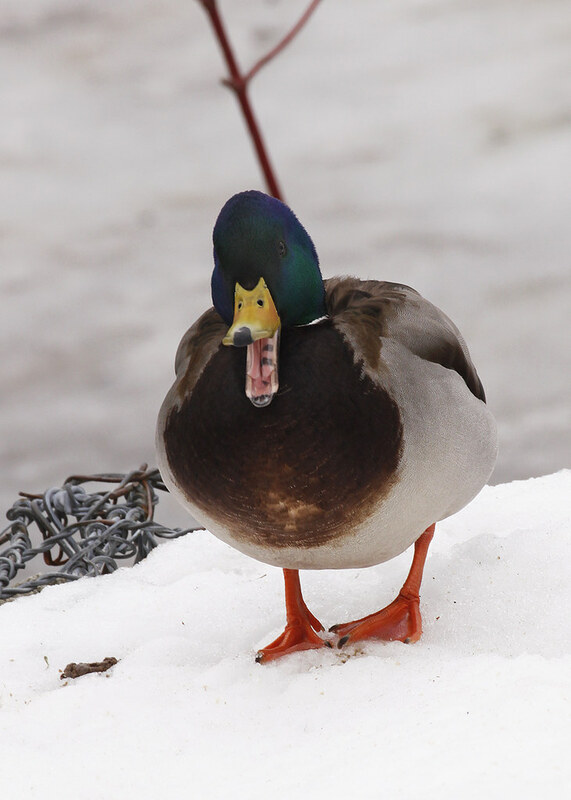 Now, stick out your tongue. Devon Drake, you're out! 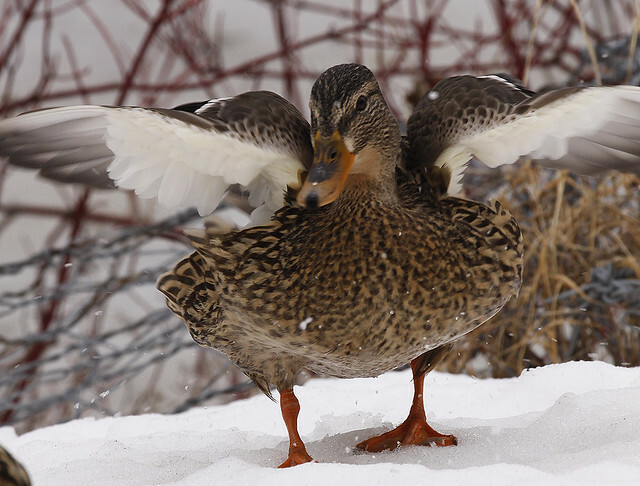 I didn't say "Milly Mallard says.."
Milly Mallard says "Touch your bill to your tail." 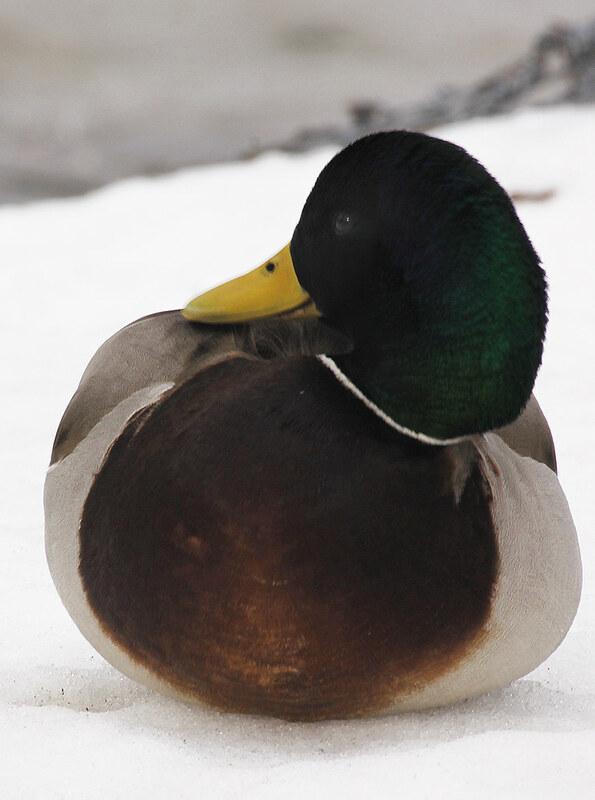 Milly Mallard Says "Look to your left." 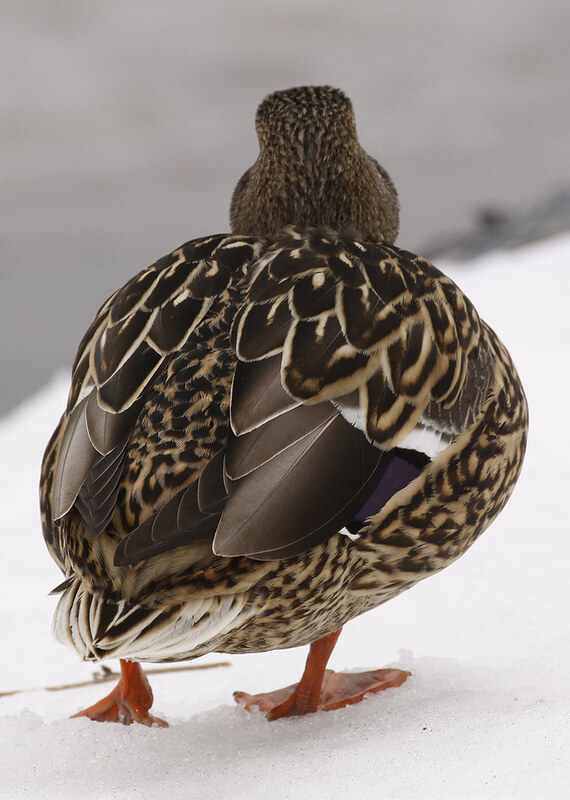 Milly Mallard Says "Show me your best side." And so marked The End of the game. 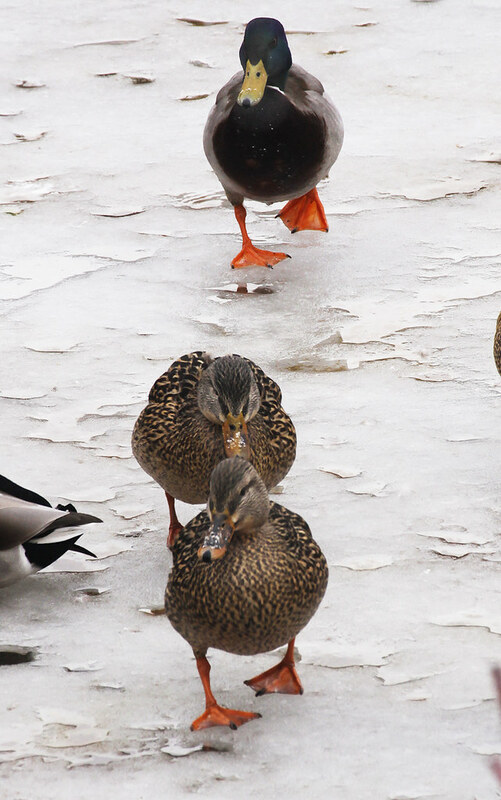 How about a quick walk around the pond? Why quick? 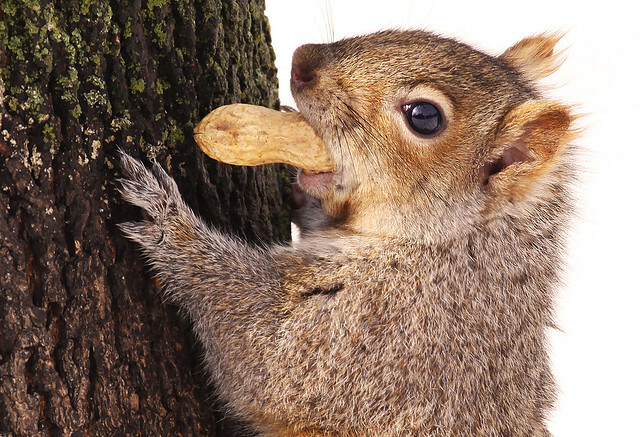 Because the squirrels are hungry, of course. Look up. 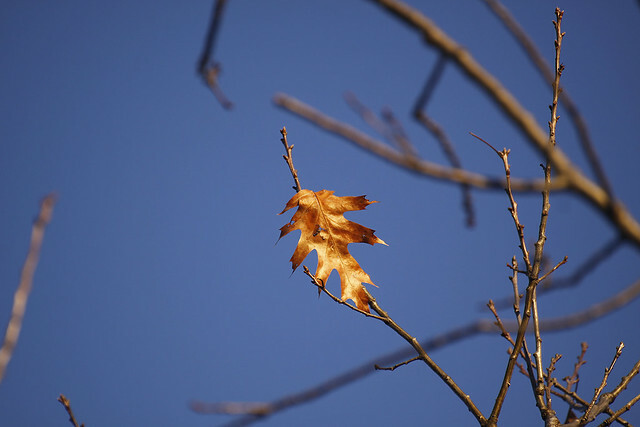 There's a lone oak leaf still clinging to the branch above us. 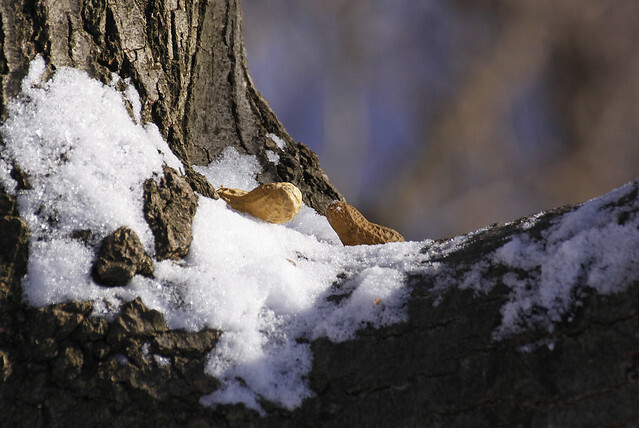 Let's leave a couple of peanuts on this tree. Stand back - a squirrel will be along in no time. Look up there - right on cue. Don't be shy, little guy. We'll let him eat in peace. 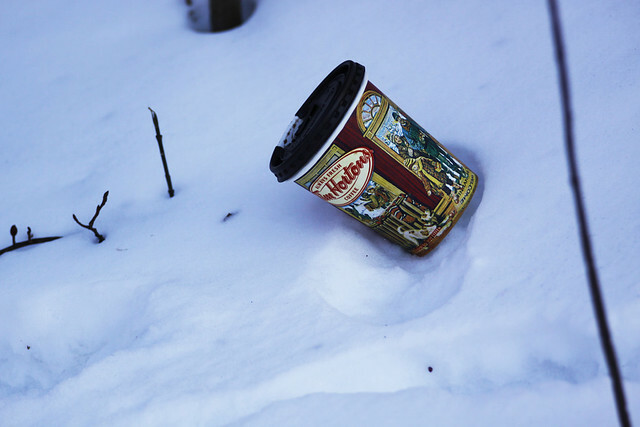 As for ourselves, there's always time for Tim Horton's (you might need to be Canadian for that to mean anything to you). It has warmed up a fair bit today, and the rest of the week is supposed to bring above-freezing temperatures. I figure this might be a good time to show you just how cold and snowy it has been for the past few weeks. 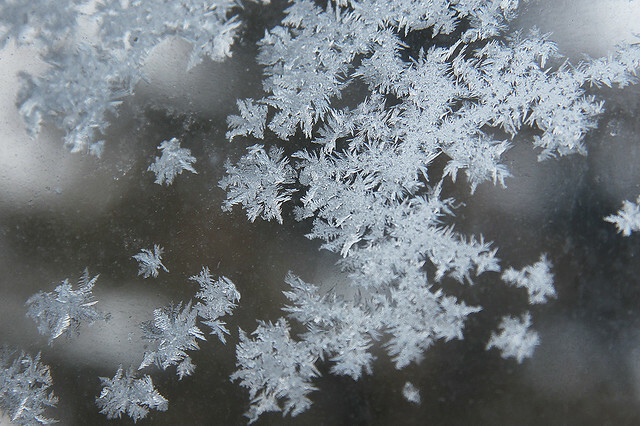 Bedroom windows are always a pretty reliable measure of the frigid temperatures outside, and of just how creative Nature can be. 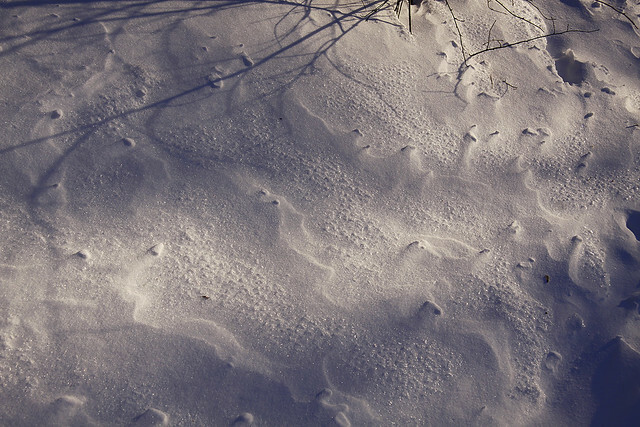 I can see patterns in these waves of frozen snow. 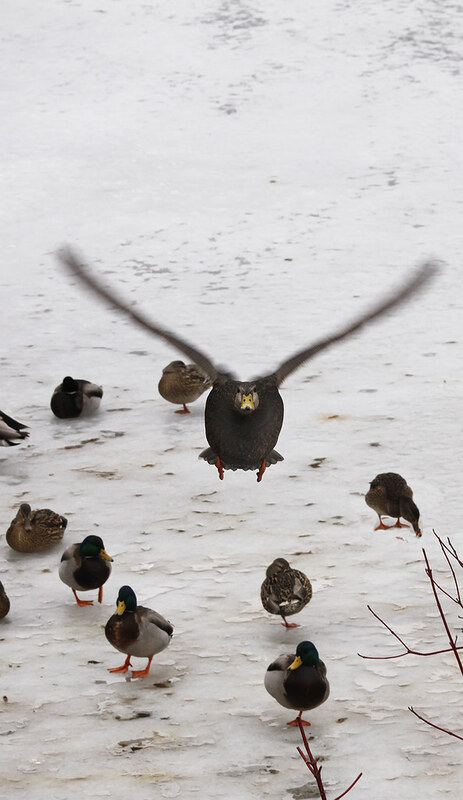 Here, I see a flock of flying dragons taking off from the icy ripples for other wintry lands unknown. 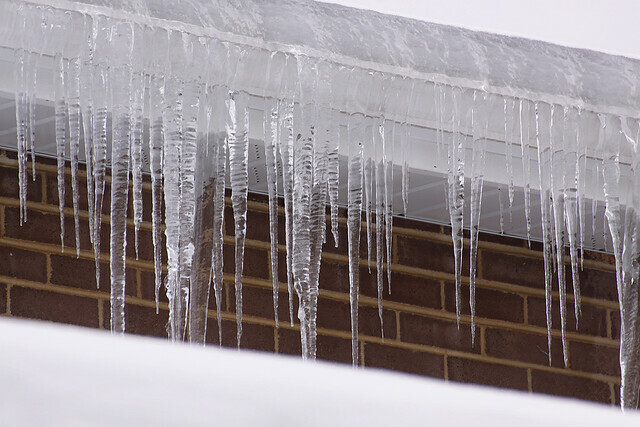 But the icy fingers of February will soon yield to warmer weather. 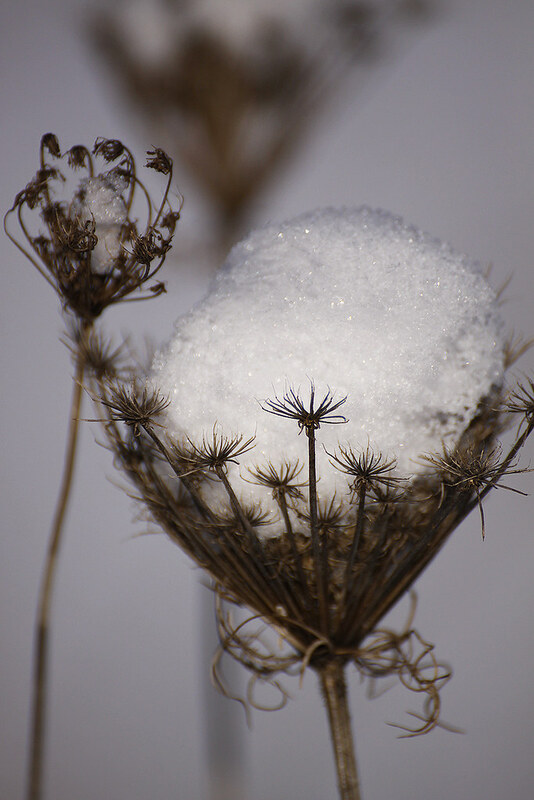 Queen Anne's Lace will emerge from beneath their blankets of snow. 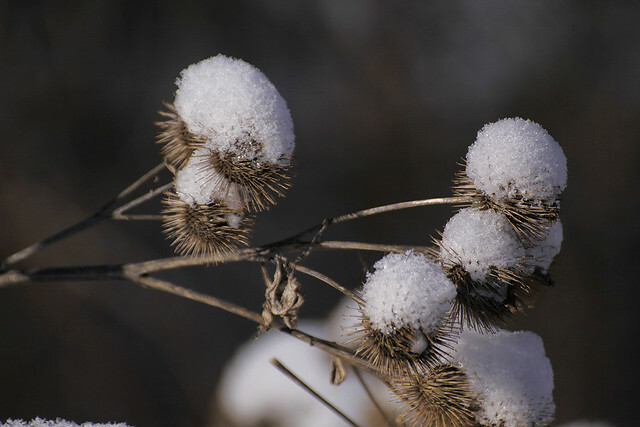 And burrs will shed their fluffy hats and bask in the sunshine. I'm going to enjoy the coming warmth because I know that winter will be back for a repeat performance. Blog post title blatantly stolen from Led Zeppelin's Immigrant Song. Thanks everyone for playing along and providing amusing captions for yesterday's post. You folks are very clever. Your captions are in the comments section of the previous post. If you haven't read them all, you can check it out when you're done here. Early one morning, I opened my eyes to see the sunlight streaming in through my bedroom window. It was just rising up above the rooftops across the street and pouring its warmth into my room. 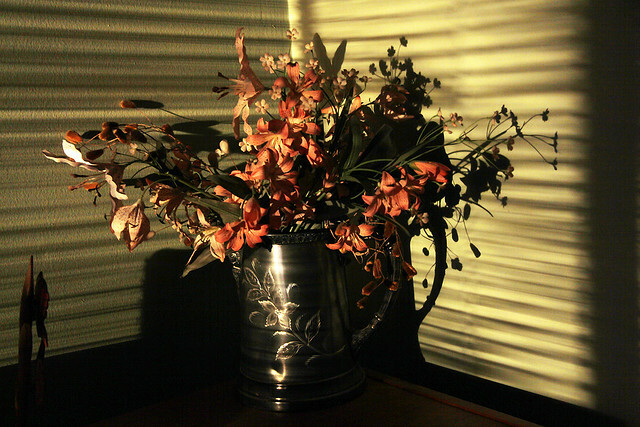 A silver coffee pot filled with fake flowers caught the light first. Luckily for me, the camera was nearby. 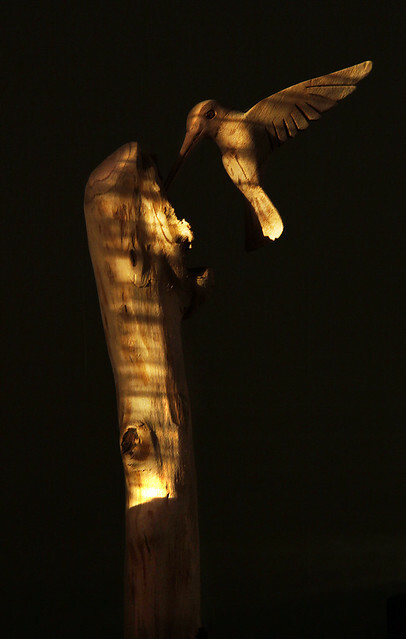 Just a couple of feet over, this wood-carved hummingbird flew into the sunshine. This was a gift from my son, who knows how much I love these creatures. 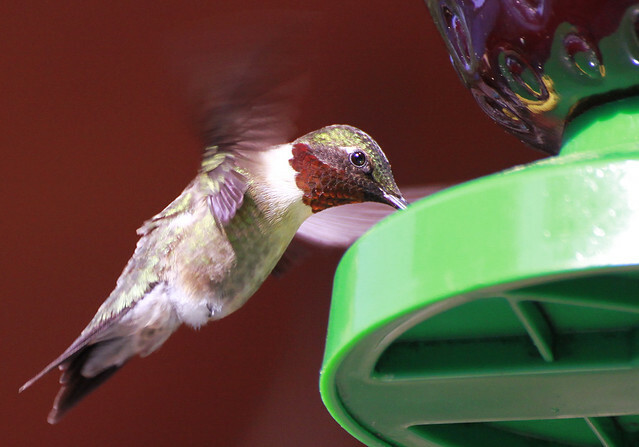 This is one of my favourite real hummingbird shots which I snapped last summer. And one more. OK, back to the morning. 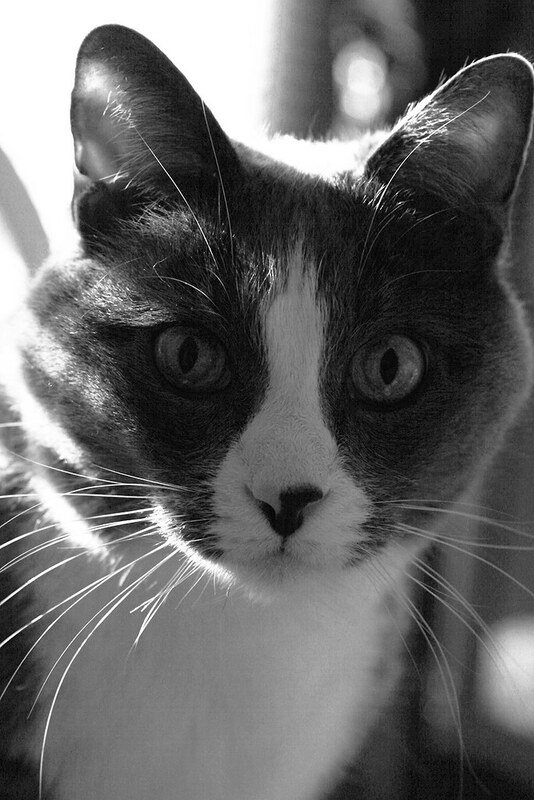 This beauty is my ever curious, ever present Skittles. He was watching me take photos on this morning and wondering when the heck I would get up to get his breakfast. I did that shortly after he obliged me with this pose. In case you were wondering why it sounded familiar, the post title is from a Cat Stevens song.